This is a Bertram Bile time travel adventure, set along the length of the River Thames in England. Bertram Bile wasn’t always like this. At primary school, he had friends, kind teachers, and great grades. But everything changed when he started his new school. His parents split up, his dad went missing, and his mum lost her job. Now he’s bullied by his classmate Angus and his evil geography teacher Miss Petrenko. His dad had been Miss Petrenko’s first love, but she never forgave him for dumping her for Bertram’s mum when they were kids themselves. Bertram feels sure that Miss Petrenko knows more about his dad’s disappearance than she’s letting on. After all, why would you take a job as a geography teacher if you didn’t know any geography AND you hated kids? 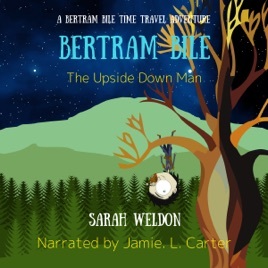 The Upside Down Man is the fourth audiobook in the Bertram Bile time travel adventure series, which follows the course of the River Thames from its source in Gloucestershire to the North Sea in Essex. But don't worry if you miss an audiobook or two, you can jump in at any point in the series. While visiting Bertram's aunty, a very old and wise witch, Bertram and Molly happen upon a man hanging upside down from a tree. Can the time travelling duo help the man find the answers to the riddles he needs to solve? If you enjoy audiobook four, don’t forget to leave a review, and check out the next one in the series The Ghostly Ship. The Bertram Bile series is based on Sarah Weldon’s real-life expedition as she swims the length of the River Thames from source to sea, visiting the places that inspired the stories. Check out Sarah Weldon’s website for all the behind the scenes of each story and swim. Look out for Sarah’s Libby Lane series too. Use the hashtag #BertramBile to find other magical fans of the series.